Finding your sloping garden a challenge? There are plenty of hilly places around the UK, including some in the beautiful South West, where we’re based. If you live in one of them, the chances are that your garden is far from flat. It may even have a noticeable upward or downward slope that makes enjoying your time outdoors difficult. With summer almost here, now is the time to tackle the problem. Sloping gardens present challenges to homeowners, especially if the slopes are steep. As gravity is working against you, you may struggle to find suitable spots for outdoor furniture and other desirable features. Soil erosion (which occurs when rain washes earth down a slope) can derail your plans for a lush lawn or gorgeous flowers. What’s more, the incline often makes garden maintenance a nightmare. But don’t despair – a sloping garden also has a number of benefits and can be re-designed so that it works for you. Land that rises or falls offers movement, variety and changes in perspective. What you need is a garden design that makes the most of those advantages while also making the area more accessible, stylish and enjoyable. Read on for our advice about bringing your sloping plot under control and creating the garden of your dreams. One of the most popular design solutions for a sloping garden is to terrace the area (i.e. divide it into different levels). That involves excavating, moving and flattening earth to produce two or more terraces linked by steps. Sturdy retaining walls (usually under 2ft high) run along the edges of the terraces, holding back the earth and giving each level a clearly defined shape. Terracing is well suited to both traditional and modern spaces, as you can see from the photos of clients’ gardens below. It’s a fantastic way to make your sloping garden more welcoming. Whereas a grassy slope can be off-putting, a series of easy-to-access levels invites you to explore the area. Another benefit of a terraced garden is that looking after it is relatively straightforward, especially if the design incorporates an attractive patio or artificial grass. Consider giving each terrace a specific purpose to help you get the most out of the space. If your garden is on three levels, you could devote the first to a children’s play area, the second to al fresco dining and the third to relaxation. 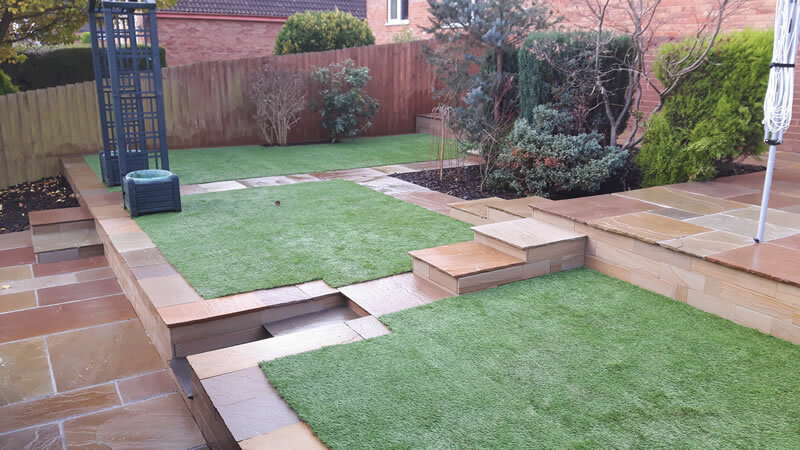 With so many options available to you, turning your sloping plot into a multi-level wonderland will give it a whole new lease of life. 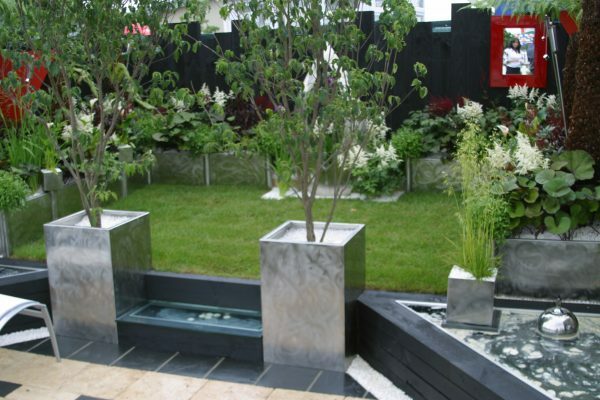 Square and rectangular terraces are ideal when you want a bold, striking garden. 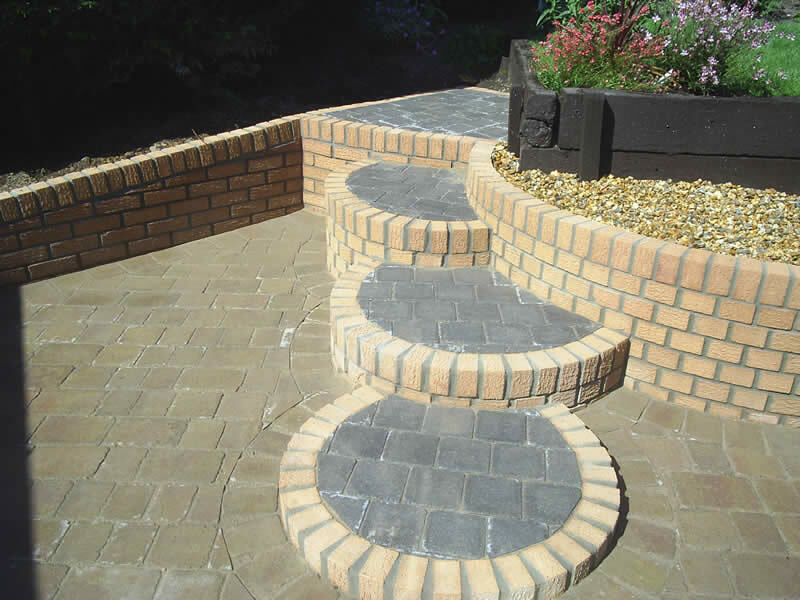 For a softer look, include curved retaining walls and steps. Curves draw the eye away from a garden’s boundaries so are also a great choice when you’re aiming to make a small space look larger. Top tip: Whether they’re angular or curved, terraces command attention, so it’s important to ensure that they’re built with high-quality materials. You can’t do justice to your design with run-of-the-mill stone flags, for example. We install superior garden paving, such as Marshalls’ Fairstone Granite Eclipse, because it makes all the difference to the end result. Another way to soften the appearance of your garden is to camouflage the boundary walls and fences with climbing plants, our custom-made planters filled with ornamental grasses and plants that provide plenty of flowers and foliage, such as African daisies and hostas. Terraced gardens are less prone to soil erosion than sloping ones, so you can look forward to beautiful blooms and greenery for years to come. Harness the power of gravity in your multi-level garden to create a unique cascading water feature that’ll mesmerise and relax you in equal measure. A dynamic feature such as a water rill makes an ideal showpiece for a terraced outdoor space. Transforming a sloping garden requires a flair for design coupled with detailed technical knowledge about everything from retaining walls to drainage systems. Thankfully, we provide a complete landscaping service in Devon and the rest of the South West. Our award-winning team has a proven track record of success. 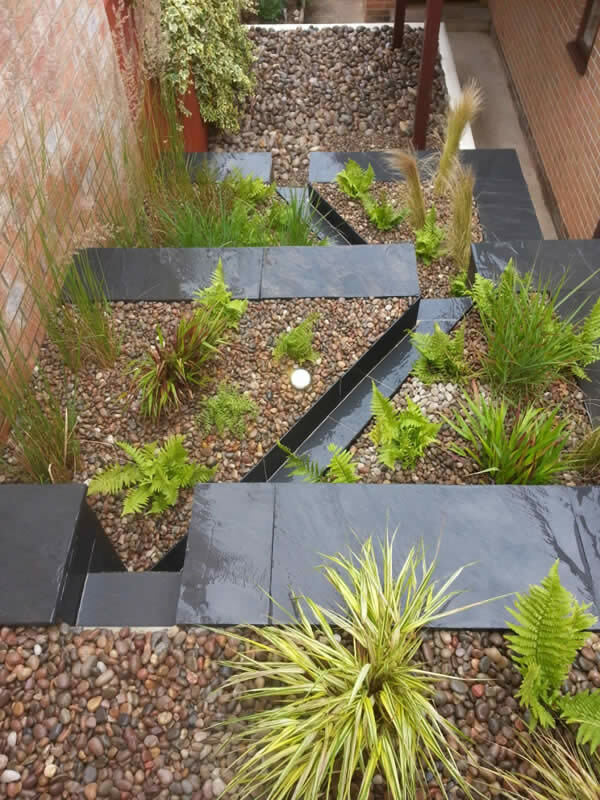 For sloping garden solutions that reflect your lifestyle and budget, please call Jackson’s Landscape Design today on 01626 332533 or contact us online.